Many advisers wonder what to do with their classes once their yearbook is submitted. How about starting on next year's book? Creating a yearbook is a huge undertaking. What if you could shave off a task or two before the previous school year was over? Obviously it isn't possible to start assigning photography assignments or writing features, but it's possible to start organizing. What went well this year? What needs some work? Make those notes and change procedures now. If you aren't a school that already takes advantage of templates, now is the time! In fact, spring is an ideal time to start designing a book's worth of custom templates for the following year. This is also a really great design exercise for your students...whether done in the spring or the fall. The most creative version of this exercise is using the internet (Pinterest - or Padlet if your school wants more security than Pinterest offers) to find layouts you're inspired by and applying the same look or feel to a layout for your yearbook. For example, we chose a layout from a newsletter we have pinned on one of our Pinterest boards and recreated it using Pictavo. Do this a dozen or so times and you've basically got a library full of templates to tweak once a theme is decided upon next year. Have twenty students? Have them each choose two layouts as inspiration and recreate, you suddenly have forty templates to choose from. Original envato designed "student newsletter" template pinned to our Design Inspiration board. Practice layout created using Pictavo. 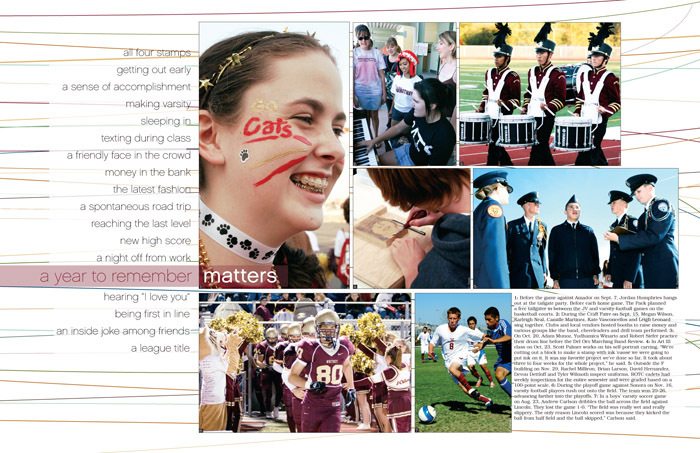 Same basic design elements applied to a yearbook layout, inspired by, but not identical to, the layout above. Keep in mind that your new library of templates won't all use the same fonts, spacing or design elements. It will be up to the yearbook staff to edit and create a sense of theme or connection throughout the book. For a truly cohesive yearbook theme, we suggest creating a style guide early in the year for your staff to follow. February's checklist was created using background B6165S, Clip Art piece C4677N_BW and Soli font. Fall is winding down, the holidays are just around the corner. The first steps of your yearbook project are, surely, already done. You've decided on the basic layout of your book, you've created a ladder detailing what falls where on your pages, and you've most likely decided on a theme. We'd like to provide you with a little inspiration from a few schools that did a great job continuing their theme throughout their book. This first school stuck with school colors through the entire book. A few key design elements (dream catchers, feathers, arrows) made appearances on nearly every page. We suspect these design elements were chosen due to their tie-in to their school mascot. These elements didn't take anything away from the layouts because they were incorporated in a way that didn't overwhelm the page. Other pieces were occasionally added for variety, but always following their school color palette. Custom endsheets and special treatments (matte laminate and embossing) on the cover were just the finishing touches this book needed. Great use of theme in all parts of a yearbook. Next up, a school that was very theme-conscious, but also took some liberties when designing for a specific club or organization (as seen on the "fabric & fashion" spread). The use of a specific color palette, design elements (arrows, again...do we spot a trend?) kept the flow of the book smooth even with a rule-breaker spread thrown in here and there. Once again, custom endsheets and special treatments (spot UV coating and matte lamination) on the cover add high quality, classy finishing touches to this yearbook. We do realize there are schools that don't necessarily choose a theme for their entire book, rather, they enjoy designing pages based on the holiday or activity contained on the spread. For those schools, we offer some suggested Pictavo artwork that may not be categorized as "seasonal", but would work great when used in conjunction with the right clipart and fonts! Using fall colors in yearbook spreads. When you follow basic design principles, the results are classic masterpieces that can be looked at for inspiration for years to come. 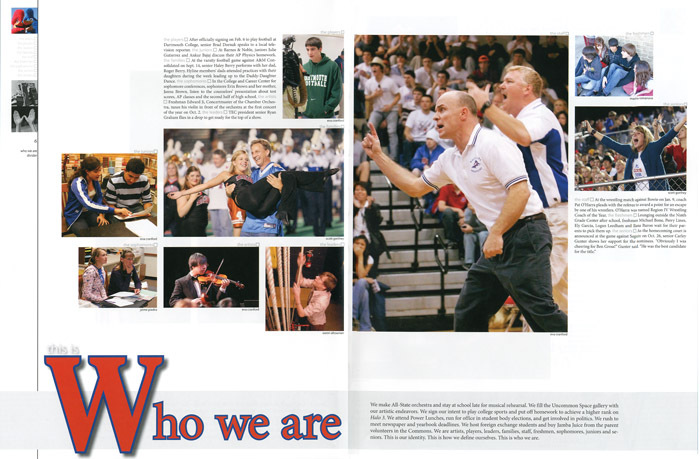 Like these 2008 NSPA Yearbook Pacemaker Award-winning yearbook page spreads. Though font styles and color trends may change over time, contrast, proximity, repetition, alignment, balance, hierarchy, white space and interesting photo angles all remain core elements of basic design. These yearbook spreads provide great, timeless examples we hope inspire you as you work on coming up with your next yearbook page ideas! Brentwood School, Los Angeles, Calif.
Del Campo HS, Fair Oaks, Calif.
San Gabriel HS, San Gabriel, Calif.
Glenbrook South HS, Glenview, Ill.
Great Falls HS, Great Falls, Mont. Shawnee Mission East HS, Prairie Village, Kan.
Shawnee Mission North HS, Overland Park, Kan.
Shawnee Mission Northwest HS, Shawnee, Kan.
Casa Roble HS, Orangevale, Calif.
Thomas Downey HS, Modesto, Calif.
Arrowhead Christian Academy, Redlands, Calif.